What is a common formative assessment? “An assessment typically created collaboratively by a team of teachers responsible for the same grade level or course. 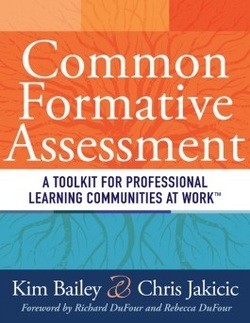 Common formative assessments are frequently administered throughout the year to identify (1) individual students who need additional time and support for learning, (2) the teaching strategies most effective in helping students acquire the intended knowledge and skills, (3) program concerns – areas in which students generally are having difficulty achieving the intended standard – and (4) improvement goals for individual teachers and the team” (DuFour, DuFour, Eaker, & Many, 2006, p. 214). What does all that education jargon really mean? Formative assessments are the checkpoints in our daily instruction. For instance, when you are at the carpet reading aloud for students, you are constantly stopping and assessing the students understanding of the book. If you were reading the three little pigs, you may stop and say, "Who are the main characters in this story?" "Will the wolf be able to blow down the first pig's house? Why?" "Do you think the pigs are afraid of the wolf?" These questions are verbal formative assessments of the student's understanding of the book because you are assessing the student's knowledge as they are learning, not after the fact. A Common Formative Assessment shares the idea of assessing the students knowledge of the skill at the time the student is learning the skill so that you can determine who needs additional help or who has mastered the skill. The word common means that all teachers in that content area and grade level are using the same formative assessment. Why use the same assessment in different classrooms? Once the assessments are completed, the different teachers can come together and begin to use their data to prompt discussion about the students performance, the overall instruction, and areas where different strategies may be more beneficial. Our motto should be "Work smarter, not harder." Also, the data can also point out students who need additional help. Not so that other teachers know who in your room is struggling, so that a team can come together and begin to discuss different strategies for helping this student improve. "It take a village to raise a child!" When we have nearly 30 students in our room, it is very difficult to have 30 different strategies for teaching a concept. It is however logical that the way one teacher addresses a struggling learner may be different than the way another teacher addresses a struggling learner. Why not bring these teachers together and come up with a plan on different strategies for improving the student's performance? Common Formative Assessments allow teachers to work together as a team to build content knowledge, to address instructional concerns, and to improve the performance of each and every child in that grade level. One of the main components to successful Common Formative Assessments is effective PLC's. Implementing Common Formative Assessments can be a long process. The steps for implementing this process are clearly outlined in the text Common Formative Assessment: A Toolkit for Professional Learning Communities at Work By: Kim Bailey and Chris Jakicic. This is a good text to consider when beginning the implementation process. Keep in mind that Common Formative Assessments create the data necessary to drive your Response to Intervention process in your classroom. Data from CFA's clearly defines who understands the skill, who needs a little more help to understand the skill, and who needs a lot more help to understand the skill. This helps the teacher know who needs to move into additional Tiers in the RTI pyramid.